If you’re concerned about the flu virus and you haven’t moved to electronic grading, now might be a good opportunity to start. Managing email. As soon as I get an assignment, I hit reply, type “Got it,” then hit send. This eliminates follow-up emails from students asking, “Did you get my assignment?” In my email program, I keep a folder called “Grade these.” All student assignment emails are moved there so they don’t get lost in my inbox. (SimplyFile makes this easy to do with the click of one button. See this post for more information about SimplyFile.) After I’ve emailed students their graded assignments, I move their emails into the “Graded” folder. Once I’ve sent a graded assignment back to a student, I move the file into a “Sent” folder. 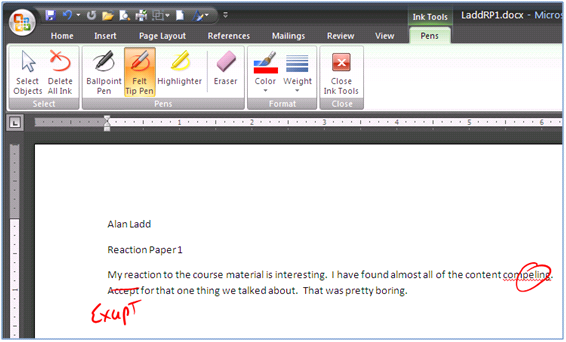 Using MS Word 2007 to grade assignments. Select the “Review” tab. Click “Track Changes.” Any change you make shows up in red. Deletions are struck-through; additions are underlined. To add a comment, with your mouse highlight the text on which you’d like to comment. Click “New Comment,” then type your comment. When you’re done, save your file, record the grade, and send the file back to the student. That’s it! That produces the “Pens” toolbar. Just write like you normally do.